Getty/Sean GallupAmazon’s one-day shipping guarantee misled customers, according to the UK’s Advertising Standards Authority. Amazon ran a misleading advertisement on its website in 2017, according to a ruling by the UK’s Advertising Standards Authority. The promotion, which ran on Amazon’s website in December, advertised the free one-day shipping that comes with Prime membership. The ASA said that 280 customers had complained about the claims in the ad. Most said that their shipments had not arrived in one day, prompting the board to review the ad and ultimately determine it was misleading. “The ad must not appear again in its current form,” the ASA said in its ruling. 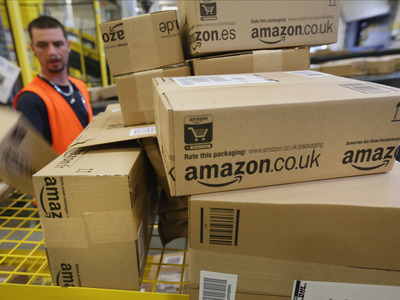 Amazon has been misleading customers with its promises of one-day shipping, the UK’s Advertising Standards Authority ruled on Wednesday. The ASA said that an advertisement Amazon ran on its website in December 2017 had claims that were “misleading” to customers. The group says that 280 people had complained about the ad, most stating that they did not receive their order the next day as promised. In response to the complaints, the ASA assessed the ad and determined that it did not make clear that not all items were eligible for one-day delivery. “Because consumers were likely to understand that, so long as they did not order too late or for Sunday delivery, all Prime labelled items would be available for delivery the next day with the One-Day Delivery option, when a significant proportion of Prime labelled items were not available for delivery by the subsequent day with One-Day Delivery, we concluded that the ad was misleading,” the ruling states. This isn’t the first time that customers have complained about Amazon’s shipping speed. In interviews with Business Insider earlier this year, Amazon customers in the US complained that two-day Prime shipments were sometimes arriving late. The complaints led some customers to realise they had a misconception of what Amazon explicitly promises with its shipping speeds. In fact, Amazon Prime’s shipping policy only promises that customers will get their packages two days from when Amazon ships it, not from the the time the customer places an order.